When I think of American comics, the likes of Phil Silver, Lucille Ball, Mel Brooks, Goldie Hawn, Jerry Seinfeld, Bob Newhart, Robin Williams, George Carlin, Gilda Radner, Phyllis Diller, Jonathan Winters, Carol Burnett, Eddie Murphy, Billy Crystal, and of course, the incomparable Bill Cosby come to mind. A clear indication that America has produced so many fantastic comedians over the decades. This enormous book is the companion to the six-part PBS series which is a treat in itself. Even though there are only six chapters (the Knockabouts; Satire and Parody; Smart-Alecks and Wiseguys; Nerds, Jerks, Oddballs, and Slackers; Breadwinners and Homemakers, and the Groundbreakers), there is more than enough information to satisfy anyone's curiosity. Along with text about the various (and numerous) comics, there are wonderful photographs, many we've never seen. I enjoyed reading about and learning some background on Laurel and Hardy, Buster Keaton, Lucille Ball, and a host of others. Some of the other talent covered in this book include The Wayans Brothers, Paul Lynde, W.C. Fields, Groucho Marx, Jack Benny, Bob Hope, Woody Allen, Cheech and Chong, Mae West, Lenny Bruce, Eddie Cantor, and so many more. 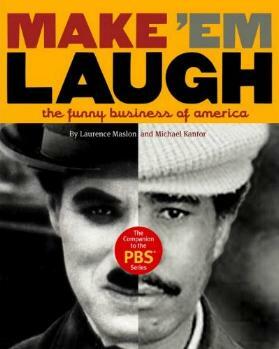 The dust jacket sums this book up nicely: "Make 'Em Laugh is more than a compendium of American comic genius, it is a window into the way comedy both reflects the world and changes it - one laugh at a time". Conclusion - A wonderful collection, and I thank the comics who've made me laugh till I either choked, went silent, or literally collapsed.